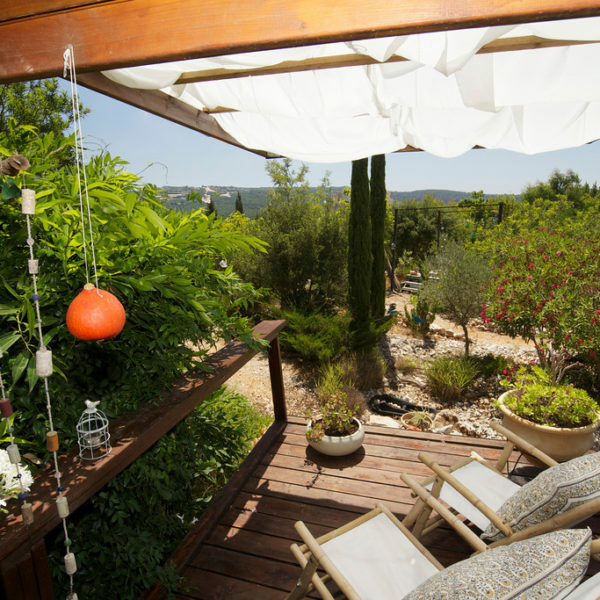 Evelin and Meir Swissa’s two wooden cabins in Moshav Shomera reside amidst a natural flowery garden overlooking the breathtaking view of the Western Galilee, with Moshav Netua and the Mountains of Lebanon rising above the horizon. ???? ??????? - ????? - ????? Meir Swissa built the wooden cabins and their beautiful wooden furniture with his own two hands. The whole complex is founded on recycling. 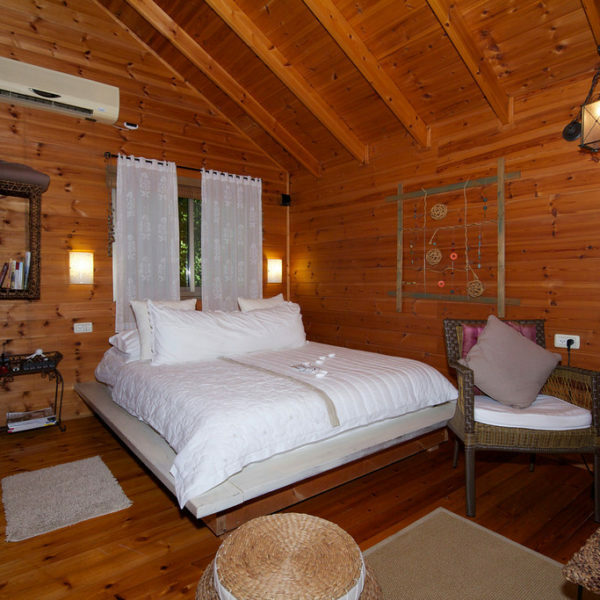 The cabins are similar in content, but different in design and are set apart from each other; each having a separate entrance and parking, thus achieving complete privacy. 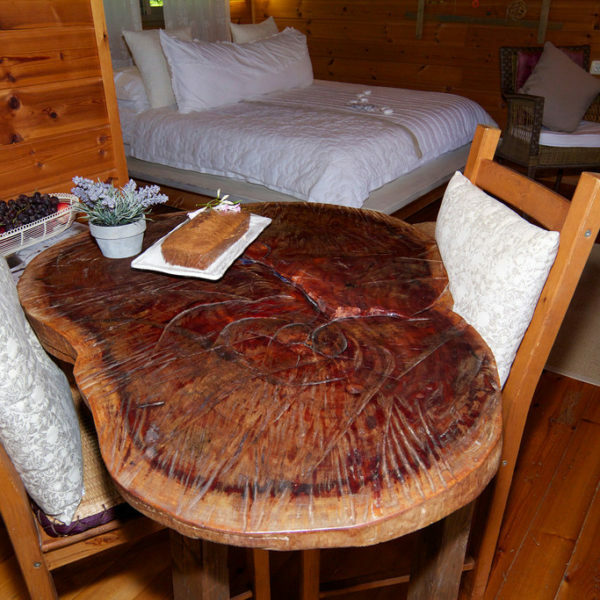 However, in the event two couples of friends are vacationing together, a stone table, seats made of tree trunks and a barbeque table are set in a small garden located between the two cabins enabling the couples to spend some time together. 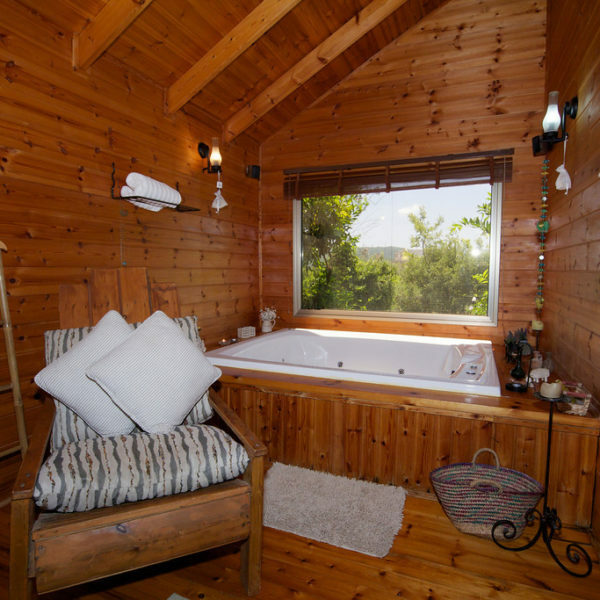 At the heart of the ‘African’ hut, guests can find a Jacuzzi corner of the Soft-Tub type, that uses energy sparingly. 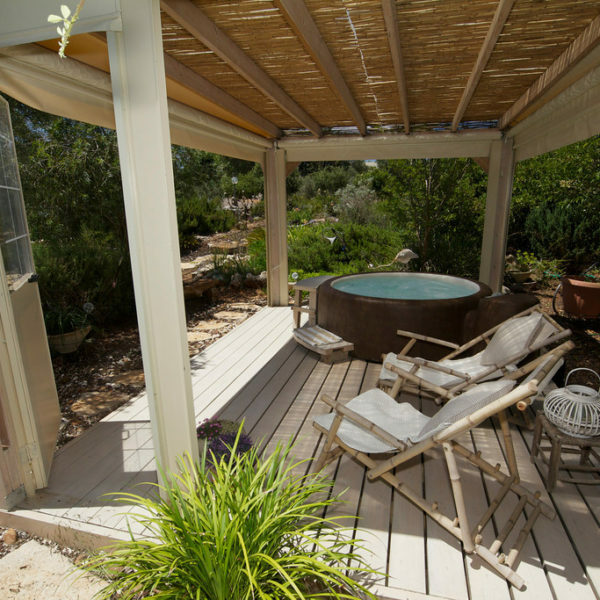 The Jacuzzi is assembled on a wooden deck under a bamboo covered roof. The Jacuzzi corner is encompassed in clear roll-up blinds for the cold winter days. The Jacuzzi is set with romantic changing lights and two lounge chairs. Not far from there, under the shade of an olive tree, a wooden bench is standing strewn with cushions. Another enchanted corner is set under the Jacaranda and Paulownia trees consisting of a wooden table and chairs and a barbeque corner. The garden blooms with a plentitude of seasonal flowers, and trees and bushes are planted throughout its area, such as: cypress, olive, Jacaranda and bushes of oleander and Bougainvillea whose strong purple color is seen from afar. Pebble pathways lead to hidden enchanted corners, one of which is an elevated wooden platform carrying two tanning beds perpendicular to each other. The platform is surrounded by four beams draped with an ethereal white curtain and decorated with wind chimes, bestowing a romantic sensation. The entrance to the cabin is through a wooden balcony without a banister featuring two recliners set against the view, a table and chairs. Breakfast can be served outside. 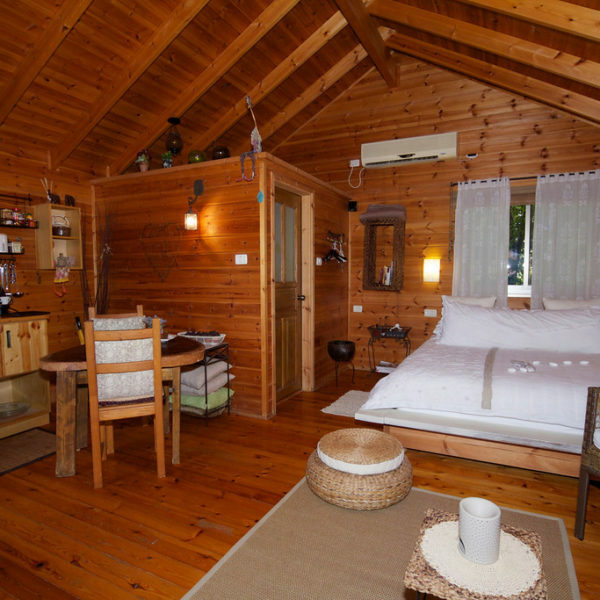 The cabin is embracing; it is covered with wood and spacious (about 48 sq. yards). An indoor square Jacuzzi stands under the large window facing the garden; surrounded with candles, candle sticks, quality chocolate and a fruit plate. On a chest in the kitchenette jars filled with roasted seeds, a coffee and tea set, an espresso machine and fresh mint leaves, a microwave oven and bags of popcorn. In the refrigerator guests will find water, light beverages, milk, fruit and in the freezer popsicles. The invested accessories are completed with a dining table and two chairs, artistic recliners, an electric fireplace, a double bed built on a Japanese style platform covered with snow white sheets. The bathroom comprises a shower behind glass doors, caressing towels, slippers, robes and pampering SPA products. Paying attention to details down to the smallest item is heartwarming. Evelin Swissa thought of it all, including a snuggle blanket for the hammock hanging among the trees outside, the books, movies, massage accessories and the Backgammon and card games. The television is connected to the home theater system and to the cable system. 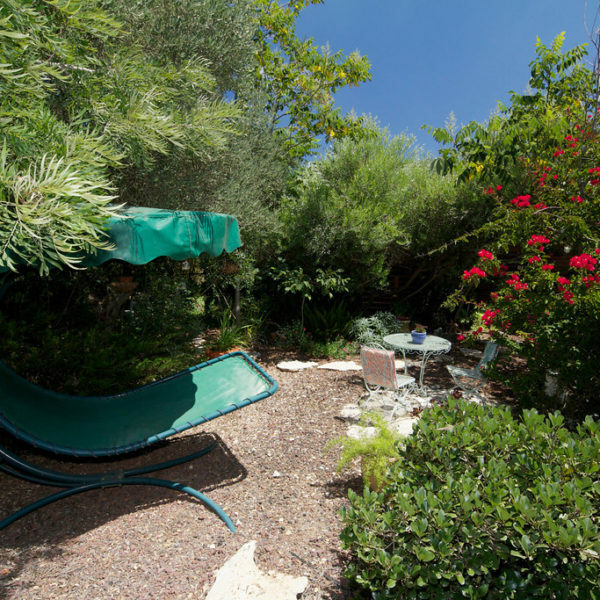 The Moroccan cabin also has a beautiful garden. Here too there are enchanted pretty corners in the shade of trees on which Ivy is crawling up, a platform with chairs facing the view. The cabin is accessorized with Moroccan items such as mirrors, cushions, tea set, lamps, tables and chairs and Moroccan style servers. 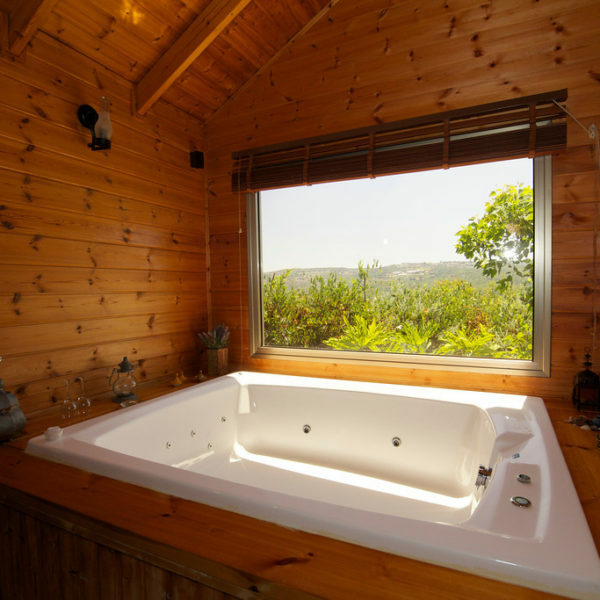 The Jacuzzi is facing the open landscape. This cabin does not have an outdoors Jacuzzi. 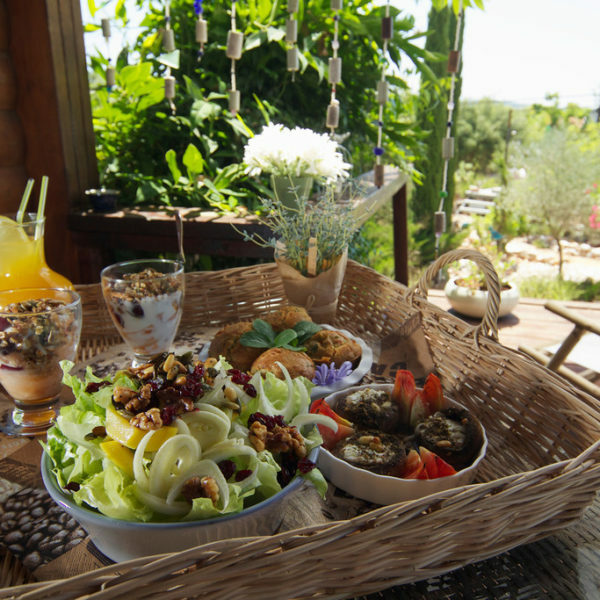 A rich breakfast is included in the price and includes: homemade rolls, stuffed mushrooms, salads, muffins, sweet potato pancakes, olive cheese roles, homemade granola and a choice of eggs. Evelin prepares meals in her own kitchen and serves them at guests’ convenience. A special gift awaits repeat customers and guests celebrating birthdays and anniversaries in the cabins.